Corsair, a world leader in high-performance PC hardware, today announced the all-in-one Hydro Series H110i GTX, the company’s most advanced and customizable liquid CPU cooler yet, as well as new Hydro Series HG10 GPU cooling brackets for NVIDIA GeForce GTX Titan X, GTX 980, GTX 980 Ti and GTX 970 graphics cards. The Hydro Series H110i GTX liquid CPU cooler pairs two 140mm fans with a 280mm radiator for extreme CPU cooling that is superior to stock CPU air coolers, delivering lower temperatures and quiet operations for both processor-intensive applications or light PC loads. The self-contained design of the H110i GTX makes it easier to install than stock air coolers and requires no filling or maintenance. The H110i GTX features a new generation, high-efficiency cooling block with a striking new look, including Titanium-colored logo inserts on the block and radiator. An optional kit with both red and blue inserts will be sold separately. 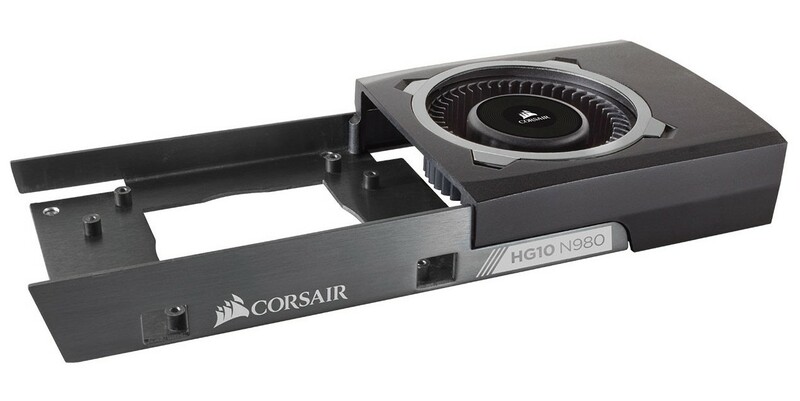 The H110i GTX has Corsair Link software control built in which allows advanced customization and monitoring by simply attaching the included cable to a motherboard USB header and downloading the software. Users can then customize and monitor temperatures, fan speed, pump speeds, and the RGB LED logo on the cooling block.